OXFORD, Miss. – The newly minted early signing period made for uncharted waters for first year head coach Matt Luke as well as everyone across the college football landscape. It was hard to gauge how many players would take the advantage of the early signing period. It undoubtedly put Luke and his staff on the clock from the moment he was hired permanently to be the head coach on November 25. They certainly took advantage of the opportunity. 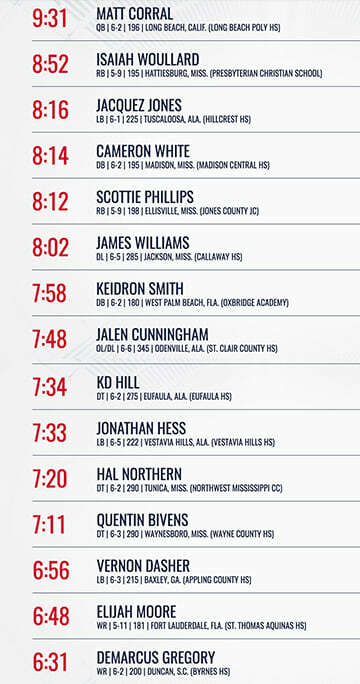 Ole Miss signed 15 players Wednesday, jumping 29 spots in 247 composite rankings. The class is comprised of six four-star recruits and 10 defensive players. The morning started with a pair of wide receivers committing to an already immensely talented position group. Consensus four-star wideout Elijah Moore flipped from Georgia to Ole Miss and will provide speed as a slot receiver, something particularly important for the Rebels. Duncan, South Carolina, native Demarcus Gregory will be joining Moore. Gregory will enroll in January and go through spring practice. Ole Miss continued to add offensive weapons by signing the number one junior college running back in the country in Scott Phillips. He will be competing for immediate playing time with the departure of Jordan Wilkins and will also arrive on campus in January to participate in spring practice. Perhaps Luke’s biggest splashing during this early signing period came when he landed a commitment from four-star quarterback Matt Corral out of Long Beach, California. The U.S. Army All-American’s commitment seemed to give this class a spark of momentum in the final week leading into signing day. The largest gap Ole Miss needed to fill was undoubtedly at linebacker. The staff signed three on Wednesday headlined by junior college All-American Vernon Dasher out of Coffeyille CC in Georgia. Dasher had 71 tackles and two forced fumbles in his lone season there. He is joined by a pair of products in Jacquez Jones from Tuscaloosa and Jonathan Hess from Vestavia Hills. Four defensive linemen inked to play at Ole Miss. James Williams, a defensive end out of Callaway High School in Jackson flipped his commitment from Mississippi State and elected to head to Oxford instead. The Rebels landed a rather intriguing player in Jonathan Cunningham Out of Odenville, Alabama. He’s a 6-foot-6, 345 pound defensive tackle that was recruited heavily by offensive line coach Jack Bicknell Jr. The staff will play him on the defensive side of the ball, but also believe he has the potential to play on the offensive line. Northwest Community College defensive tackle Hal Northern and Wayne County High School product Quentin Bivens also inked their signature to come play defensive line foe the Rebels. The four collectively make up a physical and versatile group for defensive line coach Freddie Roach as he attempts to build some depth. “They’re a really solid group to start with in that early signing period,” Luke said. The secondary got a boost with the signings of Madison Central’s Cameron White and Keidron Smith. Jones offered a similar notion on Smith, citing the physicality he brings when the football is in the air and the ball skills he possesses to go make a play on it. The Ole Miss recruiting class currently sits 31st in the country according to 247Sports heading into the February signing day. 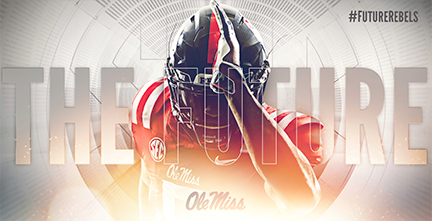 Ole Miss is not done yet, though Luke noted that he has eight or nine more spots left to fill and would like to do so with a couple of wide receivers, a tight end, an offensive lineman and possible a couple more defensive linemen.